The 69th National Book Awards Ceremony will take place this Wednesday in New York City. Nominees for the Fiction award include Brandon Hobson’s novel Where the Dead Sit Talking, Rebecca Makkai’s The Great Believers and Sigrid Nunez’s The Friend—all excellent and acclaimed specimens of a literary genre that English novelist J. B. Priestley had called a “decaying literary form” even before Nelson Algren’s The Man With the Golden Arm won the inaugural National Book Award for Fiction back in 1950. Two decades later, postmodernist American author John Barth argued in The Literature of Exhaustion that the novel may have “by this hour of the world just about shot its bolt.” He won a National Book Award six years later for Chimera. More recently, Zadie Smith discussed her “novel nausea” while paraphrasing David Shields’ description of the crafted novel, “with its neat design and completist attitude,” as being “dull and generic.” Her most recent novel, Swing Time, made last year’s National Book Award longlist. While it is hard to argue with grand, subjective generalizations about the state of the novel, some objective facts are known: It is true that many novelists find it harder to make a living today compared to just a decade ago. A study done by the Authors Guild in the United States found that from 2009 to 2015, the average reported income of full-time authors decreased by 30%. Self-described part-time authors had their income decrease by 38% over the same period. However, this trend doesn’t seem to be affecting the best-selling literary novelists. Colson Whitehead sold 825,000 copies of The Underground Railroad. Emma Healey sold 360,000 copies of Elizabeth is Missing. Kate Atkinson sold 187,000 copies of A God in Ruins. These are strong numbers for literary fiction. The second commonly offered reason for the decline of the novel is—as author Chuck Palahniuk argued on the Joe Rogan Podcast—that people don’t want to read difficult fiction anymore because film, television, and even high-end video games and podcasts serve that appetite better. People want to be comforted by their books. They want to turn pages in the safe knowledge that the cop will catch the criminal. By this reasoning, one expects authors such as James Patterson—who markets himself as the world’s “most trusted storyteller”—to continue making their millions without creating anything of enduring literary value, while the novel itself becomes a byword for schlock. I will admit that Patterson’s dominance doesn’t do much to arouse optimism. (His just-published novel, Girls of Paper and Fire, is summarized this way on his web site: “Each year, eight beautiful girls are chosen as Paper Girls to serve the king. It’s the highest honor they could hope for…and the most demeaning. This year, there’s a ninth. And instead of paper, she’s made of fire.”) But I refuse to be discouraged by the sort of novel-gone-to-the-dogs pessimism that has been around for generations. The fact is, the plight of midlist writers is not a new phenomenon. It took Henry David Thoreau five years to sell 2,000 copies of Walden. Saul Bellow, one of the great American novelists of the 20th century, was 45 before his novels earned him a comfortable living. His first two novels were commercial failures and it wasn’t until his sixth, Herzog, that he made the bestseller list. If it were true that novelists needed “quietude, time and space” to produce novels, Preston would be right to declare a state of crisis. But Bellow wrote his first novel while serving on a merchant marine ship during the Second World War. He wrote his second while teaching at the University of Minnesota. Admittedly, he had some “quietude, time and space” after he was awarded the Guggenheim Fellowship in 1948, which gave him the opportunity to move to Paris and write his third novel. But he soon returned to America and joined the University of Chicago as a faculty member. He held that position while he wrote Herzog (a National Book Award Winner), Humboldt’s Gift (National Book Award) and Mr Sammler’s Planet (Pulitzer Prize). And if Palahniuk were correct about the lack of interest in difficult fiction, one would expect to see a wide chasm between the books that win literary awards and the books that are bestsellers. However, Lauren Groff, who has twice been nominated for the National Book Award (including this year), has made the New York Times bestseller list three times. And two of the books that made this year’s longlist, Tommy Orange’s There There and Tayari Jones’ An American Marriage, were bestsellers. Whitehead’s The Underground Railroad, the aforementioned novel that sold more than 800,000 copies, also won the National Book Award. Groff’s most recent book, Florida, is a National Book Award-nominated collection of short stories tied together by geographical location and psychological condition. There are alligators, hurricanes, and stray dogs that attack. After the narrator of The Midnight Zone concusses herself by falling off a stool, her kids tell her stories while she struggles to stay conscious. In Dogs Go Wolf, two sisters are abandoned at a cabin in the middle of nowhere. The pair slowly starve while wondering if anyone will find them. In Above and Below, a woman, after losing her university funding and getting dumped by her boyfriend, is forced to live in her station wagon. These are not exactly soothing bedtime stories. The author’s previously nominated book, Fates and Furies, examined a marital relationship from first the husband’s and then the wife’s point of view. Midway through the novel, Groff vividly describes the wife’s formative years, beginning with the violent death of a sibling and the abandonment by her parents, followed by years of being cared for by a prostitute grandmother, who makes her sleep in the closet, and then by a shady uncle who works as “some kind of manager in a bad organization.” Again, not an easy or comforting book to read. Yet it spent six weeks on the bestseller list. That said, it is true that the novel has been under siege from other forms of entertainment. As poet Philip Larkin noted in 1984, shortly before his death, movies and television signaled the end of the written word as the primary form of entertainment amongst the educated class. Well into the 20th century, he noted, a “plethora of dailies, weeklies, monthlies and quarterlies” had to publish writing of all kinds just to keep up with reader demand. But when televisions became a common household item during the Cold War, the public appetite for conventional written works went into a gradual decline. The result is that every generation of publishers generally has had to be more careful with their money, since they could no longer afford to take as many chances on books that might not generate a profit—a category that often is coterminous with books that won’t get picked up by TV or film producers. Authors of a certain age are wont to complain that publishing houses now are run as a business first and a creative endeavor second. But companies can afford to indulge high-flown artistic missions only when they are insulated from competitive market forces. Publishers once could cast their bets widely (some would say lazily) on a legion of longshot wannabes, knowing that the few blockbusters that emerged would generate enough money to cover the duds. Sometimes, that took the form of editors staying loyal to their writer friends who had lost their market (or never had one to begin with). Now, however, publishers use modern market-tracking tools to filter out the duds and hangers-on upfront, while investing their acquisition money with the handful of writers who can deliver a big hit. In 2017 alone, Whitney Scharer, Kate Hope Day and Kristen Roupenian all signed million-dollar-plus book deals. Indeed, anecdotal evidence suggests that the number of seven-figure advances has actually increased in recent years—even as five-figure mid-list deals have waned. It’s the same ruthless segregation of winners from losers that you see in many industries. But this doesn’t mean you have to be a superstar to get published—because the same big publishers that have been tightening their purse strings are also losing their power as gatekeepers. Anyone can publish stories on Medium, a platform that has a monthly readership of 60-million people. Crowdfunding services such as Patreon allow readers to donate to their favorite authors directly. And self-publishing gives authors the opportunity to earn more per sale than through high-overhead bricks-and-mortar publishers in New York or London. Kickstarter even allows novels to be crowdfunded before they’ve been written. When a big publishing house takes interest in a writer’s self-published work, that writer can point to her established audience and sales history as a means to leverage a large advance. The publishing industry and its readers once were joined at the hip. They needed each other. But that is no longer the case. So yes, it’s true that the average midlist novelist can no longer fund a middle-class life with a steady succession of advances. But if she’s willing to act independently, and put her product directly to readers, she may find that monetizing true writing talent has never been easier. Love the picture of the lady wearing light-years of fabric. Looks like a great place to hide when the husband comes in the room. 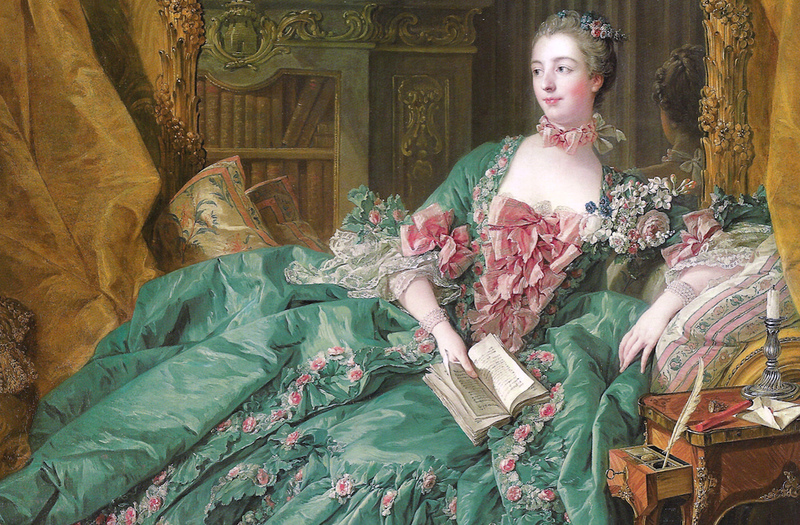 That would be Madame de Pompadour, official mistress to King Louis XV of France and painted by Francois Boucher. The novel is not dead. What Ms. Scorgie seems to be saying is. . . .What exactly is she saying? “The publishing industry and its readers once were joined at the hip. They needed each other. But that is no longer the case,” . . . “it’s true that the average mid-list novelist can no longer fund a middle-class life with a steady succession of advances. But if she’s willing to act independently, and put her product directly to readers, she may find that monetizing true writing talent has never been easier.” Heh? One service the independent publisher nobly served was to replace the patron as a source of steady income if the author fulfilled their end of the bargain, which was to write well–and even, on occasion, greatly. The publisher did the work of choosing typefaces and tackling typos—a true professional. Now all of that is gone. The largest publishers of fiction are accounting firms with other priorities than getting an advance to some scribe sharing a one bedroom apartment in Brooklyn and working the late shift, or cadging from American tourists on the Left Bank. The entire support apparatus of publishing, from editors to printers, is simply gone. The sales force of ‘book reps’ who offered their wares with loving and knowing enthusiasms (with new gossip to tell every season! ), are gone. The bookshops and booksellers with their own idiosyncrasies and affections are gone. The surviving remnant of each of these professions only serves to offer a glimpse of what is lost. And in their place we have Kindle? Crowdfunding? Kickstarter? The physical book is a metaphysical object conjured by writing and typography and a dozen other arts. But ignore all of that. Now you can cuddle all your screens and be amazed! Lucky us. Ah, filthy lucre! Damn those bourgeouis philistines! And… and … and … typography! I’m sorry the point I was making appears to be lost. Money was not the issue. Clearly, Brooklyn is no longer the refuge of cheap rents it once was. But the fact is, writers make far less per word in these digital times than they once did. Publishing is indeed a business—today as well. And writers doing all the work to take home a larger share of sales does not seem to improve this equation. The publishing profession, and its concern for the lost art of the book is what I was drawing attention to. The ‘noble servant’ is not something I can recon with. However, a basic history of the facts of the publishing industry in the twentieth century might offer some insight. Unfortunately, the word ‘ever’ makes the likelihood of such research unlikely. And I must add, the lost art of typography is a beautiful thing that made reading a greater pleasure. Sadly, the loss is yours. I am not the target audience for this article or novels in general. However, even from afar, novels don’t seem dead to me. My guess is that the 100 years from 2000 to 2100 will produce a great wealth of literature. The caveat I would offer is that much of it won’t be written in the West. As a data point, The Three-Body Problem was written in China by Liu Cixin (in English Cixin Liu). There’s two senses of “dead” conflated in here. In the commercial sense, it’s pretty obvious the novel is far from dead. And self-publishing has allowed those unpublished for a variety of reasons to find an audience and for their audience to find them. In the artistic sense, however, I’m not so sure about the health of the novel. The inbred circle of funding agencies and universities have incentivized the production of ugly offspring suffering from the same kind of ugly. For me, at least, the literary novel is dead—for the time being. Two or three years ago one could hear people bemoan the fallen journalistic standards of the mainstream media, and, lo and behold, here comes Claire with Quillette. I am hoping a rebound like this will happen to the literary novel, and that, as a genre, it is here to stay. When the rebirth comes, Dr Jack, and I’m optimistic that it will, it will come from outside. A lot of people have complained, as this author has, about the increasing ideological homogeneity of the literary world. But it goes deeper than that. Not only do people increasingly share the same attitudes, they’re also intellectually shallower than they used to be. Compare the big literary magazines—New Yorker, NYRB, TLS—of 20 years ago with their present versions and you’ll see what I mean. The originality within all forms of art is dying. Nothing apart from everything is infinite. The 80/20 rule applies here – we humans are struggling to find the last 20%. Luckily though we are temporary beings, thus the new beings can reinvent and enjoy this as if it were original. So, James Patterson is schlock? How DARE he (co)write stories people actually read and enjoy! Indeed! Though that simple truth is buried a bit deeply in the article. Yet people continue to eagerly buy and ‘consume’ the same stories in multiple formats. Far from cannibalising book sales, movie and TV adaptations boost such sales and give new leases of life to old books. Multi-format synergy remains stronger than any competitive effect. Beware of the definite article! ‘Novels’ are fine. ‘THE Novel’ is a different matter. But it’s always been a different matter, hard to define. How’s about forgetting the ‘The’ and just writing good book-length stories? Of course the ‘novel’ isn’t dead, but it’s no longer called the novel and whatever it is is on life support with the exception of simplified texts like YA multipart adventure dystopias. Literacy is in contraction, there can be no doubt about that. And information is now amply available in image, moving image and organized sequences of both. And paradoxically, the West AND East are predominantly visually illiterate. That’s recipes for mind control by anyone who can aggregate media.